I've been in a major isolationist mood myself and still have been out of my MMO mood. I did sign up for a RP group that is once a week for two hours in EQ2, so am getting in-game *some*, but for the most part I'm still engrossed in my single player games. Just finished playing my first run through of Mass Effect! After I got done getting all weepy at the ending (I always seem to cry at the end of games, movies, etc. ), I made another game to play through with a different class, so have been getting that all set up. Not sure when I'm going to get done with isolating myself. Eventually it always happens that I get in the mood again for MMOs, but it hasn't happened yet! It's good though since it allows me to catch up with my single player games. Of course, I've been planning to blog about them all and haven't stopped playing long enough to write! Yeah. It is the same thing here. When I am in this kind of mood the only thing I can really play is single player games. If there is an event or something going on I do try to break it for a little but it requires a ton of effort to do so. Nice about Mass Effect! Myself I am not doing so much of a catch-up as going through another play-through of Fallout: New Vegas. Going with a melee character this time since I got the urge of using a chainsaw for some reason. No, I don't understand that either. Yeah, eventually I do get in a MMO mood too. Still it does feel like this mood swing came in a bad time as a lot of stuff is going on the MMORPGs I (technically) play and I there is stuff I *really* want to wrap up on EQ2 so I can quit it. I guess games like Final Fantasy X-2 might be the exception though as they seem to be more of a direct sequel or something like that. Again, haven't really had the chance to play it so I could be wrong. My mood swing is at a bad MMO time too. There is so much I want to get done in EQ2. Have tons of Quo and crafting to do on multiple characters and still working on getting Sabine through quests and levels. Eventually the mood will come back, but I end up missing out on holiday events and such. Still, can't be helped! I'm really looking forward to Fallout: New Vegas. I did very recently get the Fallout 3 GOTY edition, so will finally be playing through it "soon". I had lots of fun with the parts I did play back when the game first came out, but my PC at the time had a lot of trouble running it. By the time I upgraded, I was deep in my MMO mood and still hadn't gotten back to it. But I'm very close now to getting back to both of those Fallout games. Hopefully by the time I get done with Fallout 3, New Vegas will have a GOTY edition or something similar. I messed around with house modding in Morrowind and it was really fun being able to customize houses specifically for my characters, and have chests, crates, boxes, etc. exactly where they are needed. One of my characters was in the Redoran faction and I made a little temple room for him in his house in Ald'Ruhn. I still actually have a lot I want to do in Morrowind too. Currently, I'm playing through the Mass Effect game as a renegade, female Shepard Adept class. My first was as a paragon, male Shepard Soldier. I'll make an Engineer next, and then I'll replay the Soldier with an added biotic skill. Haven't decided exactly which one, but leaning towards singularity. Because I had played through as a soldier, I was able to give my current adept the assault rifle, so I'm not totally dependent on the biotics, which is good since I'm not very used to them yet. Good to know that the Final Fantasy games are mostly self contained. I wasn't sure whether I would need to try tracking down the first one (I think the Wii has it available for download), or if it mattered which one I played first. Well, the thing is... What is mainly keeping me on EQ2 right now is, to make a long story short, a promise I made to a friend to decorate her house. Only problem is I've been in a sort of decorator's block for a while so every project has been a struggle. At least she is a good sports and doesn't mind me taking forever to finish it. Yeah, I lost count of how many city festivals and holiday events I missed because of these mood swings. Not to mention all the other MMORPGs I technically play that end up being neglected. Oh, well, like you said, it can't be helped. I got the Fallout 3 GOTY edition too when it was on a steam promotion. I was still with an itchy for more post-apocalyptic games and was curious to see the differences between it and New Vegas. I haven't played it much myself yet. It is on the "to finish someday" pile of games. I didn't mess much with housing in Morrowind. I did *try* but all my attempts felt very artificial and blocky. Didn't feel like a house/mansion/uber secret villain hideout. So I gave up on it. That was a long time before I played EQ2 though and got into decoration. I wonder if things would be different now. Unfortunately, as much as I love Morrowind I don't think I could play it now. What with the buggy engine crashing every 30 minutes or so no matter what and other limitations that would drive me insane. The cool thing about the Final Fantasy series is that not only each game is self-contained but each one explores a theme both in terms of setting and story. That means every game is a different world, with a different cast of characters and without any reference to previous games. 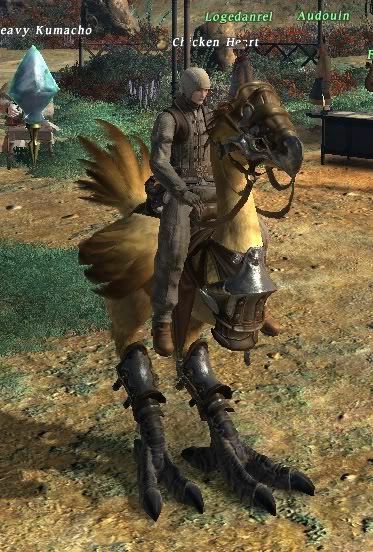 The only thing that links the games, besides the name, are certain elements like the chocobos, moogles, theme songs, etc. Final Fantasy I through 3 might be the exception to this rule though. Not sure as I never played them. They were the first one so there was still a lot of experimentation going on. Oh, and also Final Fantasy X-2 and Final Fantasy XIII-2 which from what understand are part 2 of Final Fantasy X and Final Fantasy XIII respectively. Again, never played them and no I don't understand the funky numbers either. The console commands helped me a lot with Morrowind when I'd run into a bug. I had trouble with some NPCs moving out of place or just disappearing, so I would use the console to put them back where they were supposed to be. Overall, I didn't have too many bugs though. When you played your soldier in Mass Effect, did you start a new character for hard mode, or did you use an existing one with the new game+ option? I think with the harder modes like insanity, you almost need to use a character that's already leveled up a good bit. If you're a soldier without immunity in insanity, you're probably toast! So far I've just been playing on normal, but when I want to get the insanity achievement, I'll probably just pick between the soldier I plan to make and the adept I'm using now, depending on which I think would be successful. I think the -2 in the Final Fantasy games just means the 2nd of that game. Like with Final Fantasy X-2, it would be FFX (part -1 implied) and FFX-2. If ther'es no FFX without the -2 though, then I'm baffled! It wasn't so much a case of bugs as with the game simply crashing. Hard. Frequently. I believe I did use the game+ option, yes. But the main reason I gave up was because I honestly didn't want to go through a third play-through. Specially because I was playing Mass Effect 2 at the same time and my main reason to do so was to import a pure paragon Shepard without the mistakes of my first play-through (like an "Oops!" moment at the end of Mass Effect 1). The achievement would be only a bonus. Yes, I know the -2 in Final Fantasy X-2 means part 2. It just makes me scratch my head of why they just didn't call it Final Fantasy XI and then named Final Fantasy XI into Final Fantasy Online or something. It wouldn't be the first time the franchise experimented with stuff that characterizes the game series. I mean, with Final Fantasy VII they moved to full 3D characters. Then with Final Fantasy VIII they experimented moving from chibi-style characters to a more realistic style. And so on.